IN MAY 2009 61 WATROO POINT WAS SELECTED BY OCEAN HOME MAGAZINE AS ONE OF TOP 25 HOMES IN AMERICA. Design of this home took over a year with commitment to creating a home like no other. Every aspect of this home is simply the best available including Marvin windows, Carlisle wood floors, William Ohs cabinets, and on and on. The building site was selected for its views, privacy and easy access to one of the finest country clubs in the south, the Daniel Island Club. It is a 3 minute walk to the club house and social membership privileges are included along with the option to upgrade to a non-recallable full golf membership. 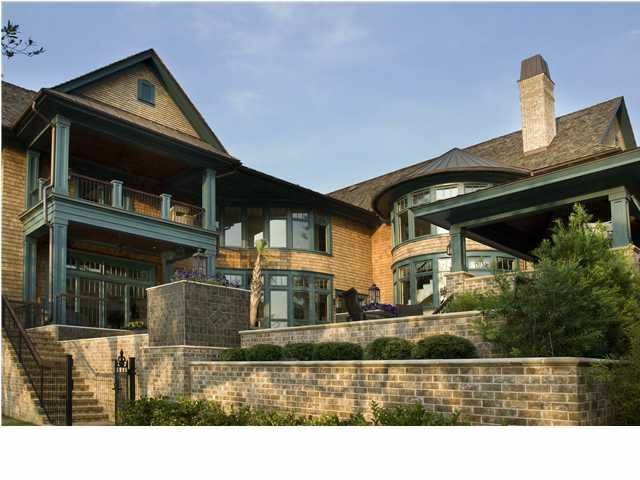 The property features unobstructed views from the front of the signature 18th hole of the Beresford Creek Course. 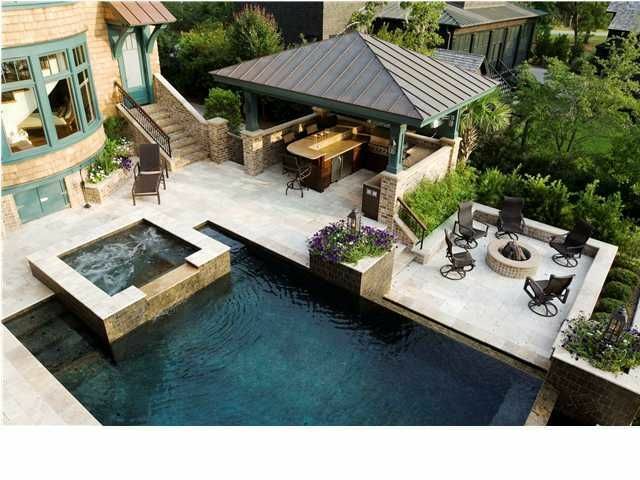 The rear of the home features a stunning outdoor living plaza. The cabana kitchen/bar creates one of the best pool-side scenes in town for hours of fun with family and friends. 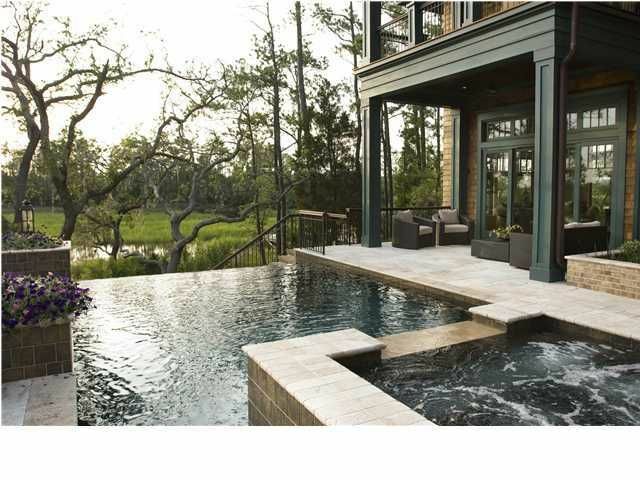 Relax in the spa and dual edge infinity pool that is heated or cooled for year round enjoyment. After dinner come out and enjoy the dramatic fire pit. Inside the home encompasses an atmosphere of informal elegance set within a masterpiece of architectural design. A few highlights include serpentine windows walls, gracefully curved bay windows, random width Carlisle heart pine floors, beautifully paneled walls, coffered and vaulted ceilings, 5 rooms with fireplaces, hand crafted wrought iron chandeliers and a three stop elevator. The bar features a 800+ bottle wine cellar with a computerized wine inventory system. The kitchen design has been created by Wm. Ohs Kitchens, perhaps the premier kitchen designer in the world. The home automation system features inside and outside audio/video controls, climate and lighting controls and IPod docking station. The second floor features a commanding billiards room with a wet bar and a fully equipped theatre room featuring a Runco 65" plasma TV. Make your way towards the master suite enjoying stunning views offered by the serpentine window wall. The master suite is one of the most spectacular rooms in the home. It features a private porch, fireplace and large bay windows with amazing marsh views that will make waking up every morning a joy. The extraordinary master bath is enhanced by an oversized jet bath, a generous steam shower, and all the other elegant appointments needed for complete relaxation! The custom cabinetry in his and her closets is a true delight. An optional 5th bedroom with bath may be added on the third floor with stairway and elevator access. This property includes Daniel Island Club social membership privileges with access to the club's swim, tennis, fitness and dining facilities, plus the opportunity to upgrade to transferable, non-recallable golf membership. Buyer pays a onetime neighborhood enhancement fee of .5% x sales price (not to exceed $6,149.00) to Daniel Island Community Fund at closing. Daniel Island Resale Addendum will be required on offer to purchase. Daniel Island resale Addendum, property disclosure, Community Fund Disclosure and Club Membership Acknowledgement are attached. Buyer to confirm any information in this listing that is important in the purchase decision such as but not limited to square footage, lot size, taxes and schools.